This stew is so easy to make. One of those recipes I have repeated time after time when I crave for a warm hearty stew but could not be bother or too tired to hang around long in the kitchen. All I have to do is cut the vegetables and chicken, then just add water and boil till just about tender then add spicy sauce. That is it. Couldn't be simpler, grease free cooking. It does look good with a bight red soupy sauce, lovely strong peppery flavoured but doesn't blow your head off. The essential ingredients for this stew are Korean chilli powder and Korean fermented chilli paste called gochujang. 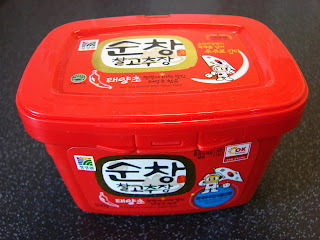 Korean chilli powder does look very red but it's quite mild - medim hot. Essential ingredient for making kimchi. I can find it easily at most oriental supermarkets. 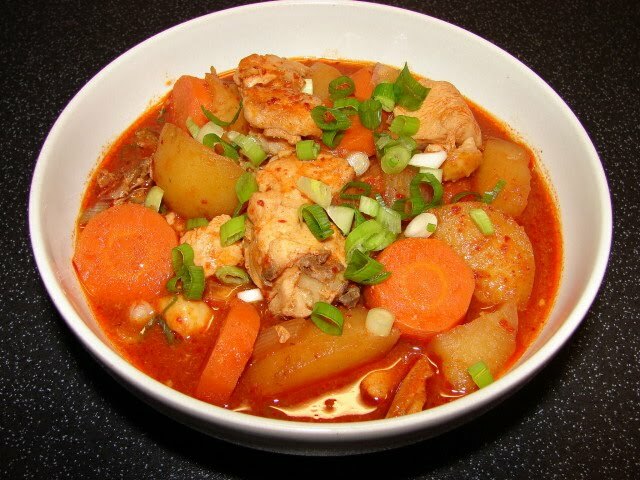 For this chicken stew here is what I did. ** If I am too lazy I will leave out the marinate, just add plain chicken to the stew. Peel and cut vegetable into bite size or chunks. Put vegetables in a pot, add about 1.5 -2 cups of water. Boil/simmer till vegetables are almost tender. Stir in the chicken. Simmer for few minutes then add sauce. Continue simmering till chicken is cooked. For boneless chicken in small chunks this will take about 10 - 15 minutes after adding the chicken. Chicken with bone with take longer, from 15 - 25 minutes depending on size. When chicken is cooked. taste to see if you need more chilli paste, chilli powder, salt or soy to taste. Its now ready to eat, If you are not in a hurry and the sauce is a bit too runny leave it for a while the potato will absorb some of the liquid. 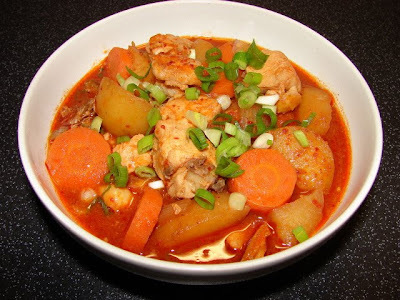 I find the stew actually tastes better sitting around for a while, potato and chicken will absorb the flavour much better. Before serving sprinkle on some chopped spring onion. For a change, you can add tofu pieces and kimchi, just as nice. This will make it more like a chigae or jiigae. Thanks for the recipe...Just bought some Korean Chili just like the one you show...in Bandar!! 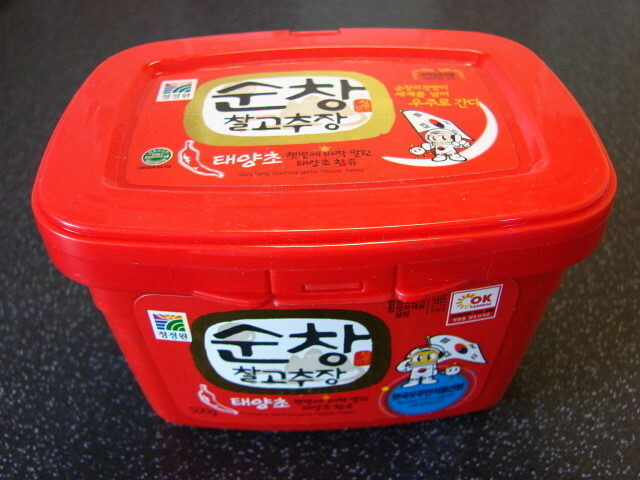 Korean chilli paste is quite versatile. Nice stir into korean style mixed rice bibimbap. I somethime add 1 - 2 tsp to Maggi mee (instant noodles), great for bbq/grilled meat marinade too. I stumbled upon your blog while searching for water roux for bread making. Thanks for the info, mate! Wow...you really have such awesome delicious recipes! Hello.Found your blog while searching for "muah chee". Thanks for sharing all these wonderful recipes. Cheers.